Creating a job portal is not as simple as creating a blog or corporate website! It will definitely need more time and efforts. But don’t you worry a bit!! 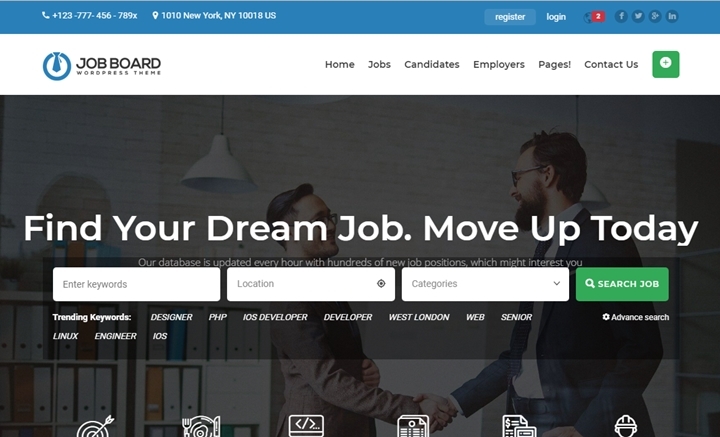 This collection of some of the best WordPress Job board themes for 2019 is to make it easier for you. Alternately, you can use this job board directory software to create your job board website effortlessly. The themes in this lists include simple job board themes as well as a full-featured comprehensive job listing WordPress themes. Besides, it also includes some themes for creating micro jobs website or a freelancing marketplace. So, let’s have a look at these awesome themes and their features. 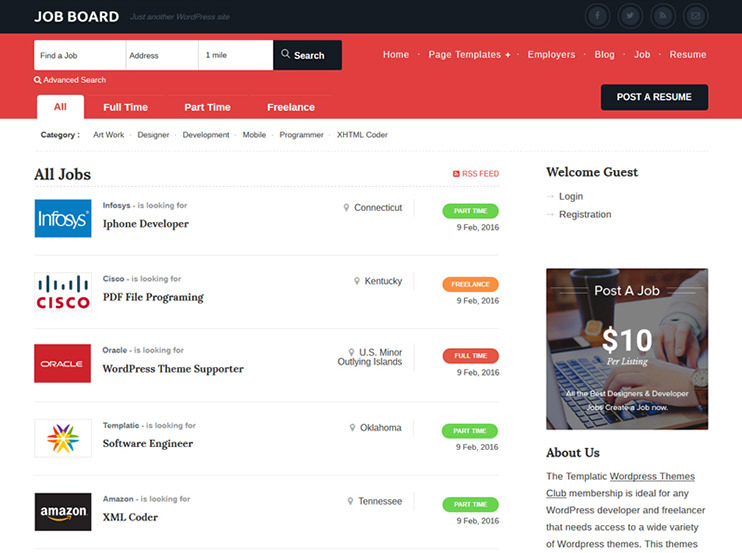 Job Finder is a gorgeous and feature packed WordPress Job Board theme for your next project. This theme is based on one of the most popular job manager plugin, WP Job Manager. Job finder supports Elementor page builder and you can easily restructure the pages of your job board with the drag and drop editor. Moreover, the Job board theme is SEO friendly and comes with pre-designed page templates for you to get started in minutes. Job Finder is easy to use and an affordable Job Board theme with the finest features to launch your job board website. Create an online directory that lists job vacancies in different companies using the Job Directory WordPress Theme. 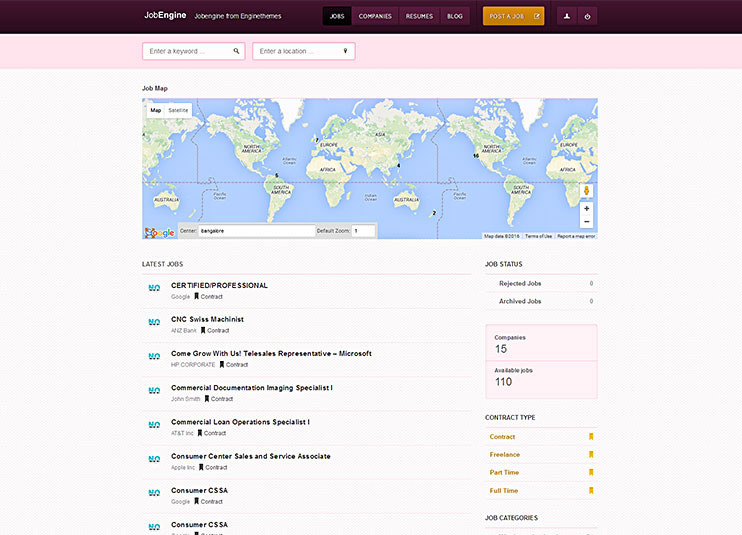 The job directory theme comes with different homepage style options. It comes with inbuilt options to manage different job types, and job status tags. Different companies can also display their company profiles using the inbuilt options. Jobs directory theme allows integration of some of the finest WordPress plugins. It is SEO friendly and speed optimized for a brilliant job board website. Starting an advanced job portal usually meant spending thousands of Dollars and months of work. 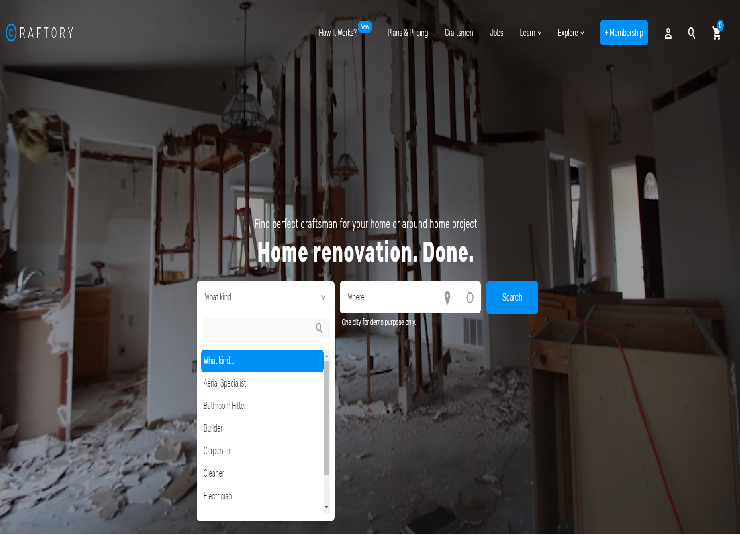 With the Job Board theme and it's 1-click install feature you can get started quite literally within minutes. It doesn’t get easier than Job Board to get your portal online. The Staffscout job board theme comes with a variety of stunning layouts, tons of beautiful elements and flexible options. It comes with a one-click easy install feature and well-documented guides you can easily use this theme for any of your job portal websites. The themes comes with multiple plugins compatibility like WPML, Visual Composer, Contact form 7, WooCommerce and Yoast SEO. You can submit your job resumes and search the jobs as per your requirements. 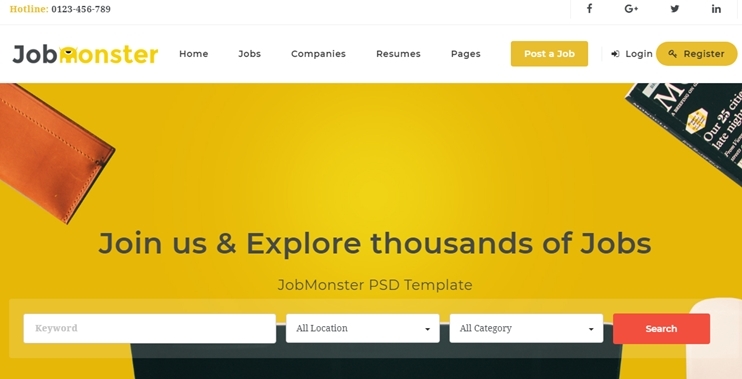 Job monster is a modern WordPress Job board theme with fresh look and complete features. The theme comes with many Advanced features like filtered Search, Front-end submissions for jobs and resumes, Admin Review, Paid job pricing packages, email alerts, etc. For page building you can use the WP Bakery page builder(Visual composer). It also allows WooCommmerce integration and allows several popular payment gateways for payment processing. The theme comes with multiple demos to choose from. There are different demos you can use for different kind of websites. For example, if your site is focused on resumes, you can use the resume home, or you can use the candidate search home, etc. Besides, you get complete video tutorials for your job board site configurations and use. InJob WordPress Job board theme is a complete solution for recruitment agencies and job consultancies. You can choose from over 7 beautiful variations of the homepage. Moreover, you can even change the look and feel with the available customization options. The theme comes with many exciting features like notification and suggestions for the users, advanced search, beautiful and feature packed dashboards for employers as well as job seekers. It also supports social logins, job alerts, apply with LinkedIn. The theme supports Visual composer and WooCommerce & comes with different payment systems integrated. 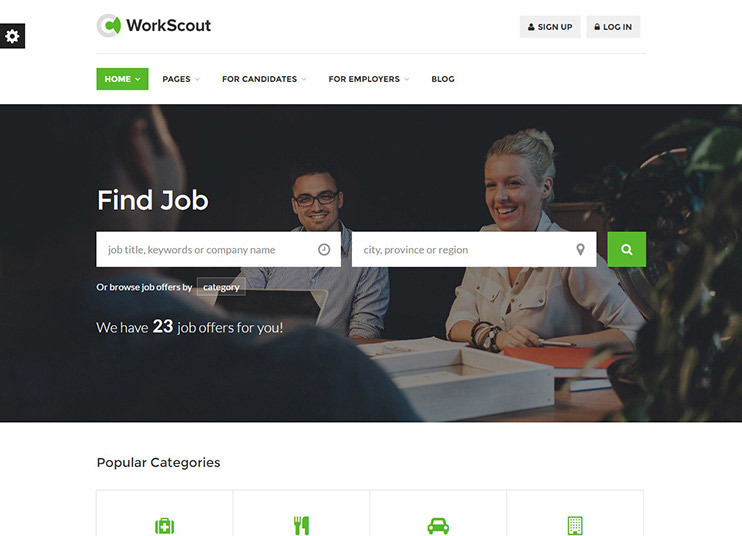 Work Scout is a feature-rich WordPress job board theme. It lets you create a comprehensive Job board website easily. This theme has a simple yet elegant design. This theme relies on external plugins for most of its features. It comes within bundled Visual composer for page building. It is based on the WP Job Manager plugin. Besides you can purchase and use resume manager, application deadline, job alerts, bookmarks, and WC paid listings. You can create an online employment exchange using this theme. 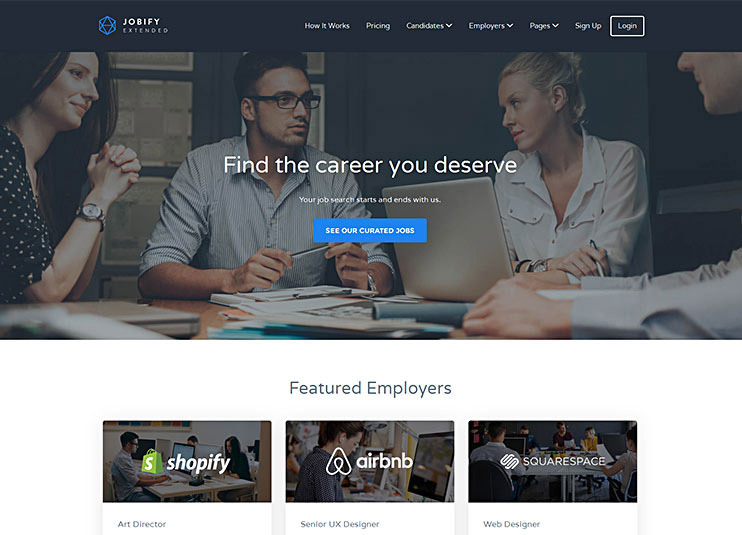 Jobify is a feature-rich and flexible WordPress job board theme. It is simple, professional and easy to use. The theme allows you to choose from the available page template designs. Jobify is easy to use and supports a wide range of job-based features through dedicated plugins. It allows front-end job and resumes submission. Jobify is highly customizable. With this theme, you can make your jobs board website look just the way you want. 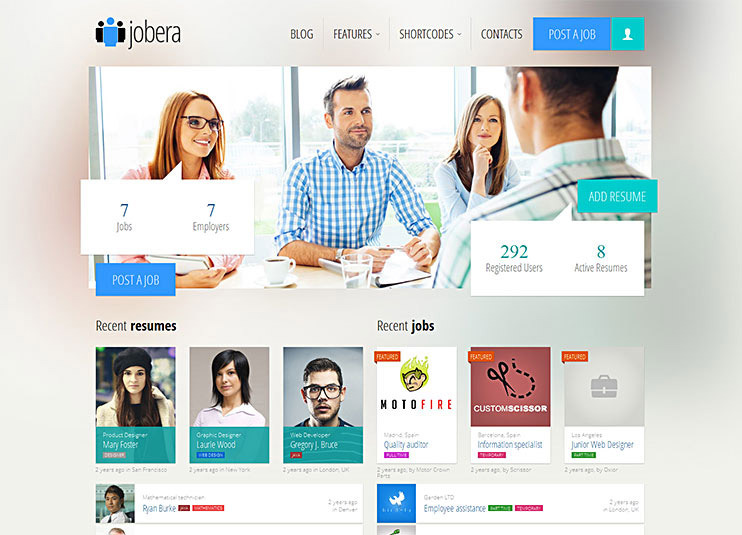 Jobseek is one of the premium job board WordPress themes. It is a comprehensive, easy to use and feature rich job board theme. It has a clean and professional design. Create pages with the Visual Composer drag and drop page builder. 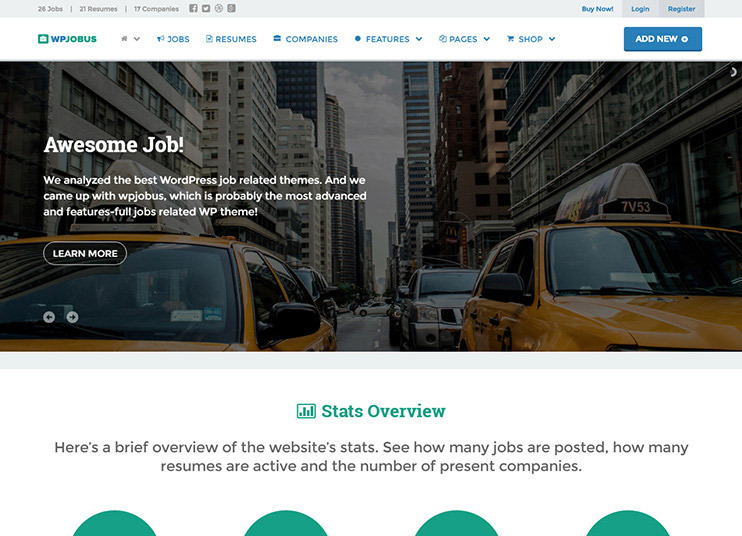 The theme works on the base of the free WP Job Manager plugin. It allows front end job as well as resume submission. To charge for the submission, you can use the WooCommerce paid listings. JobSeek focuses on jobs and that's all. Without any additional settings or tweaking, the theme will start serving as a professional job board. 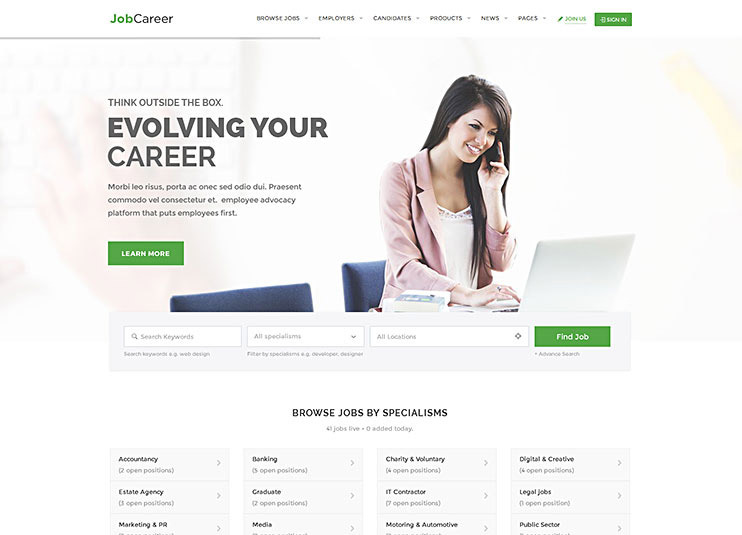 JobCareer is a complete WordPress job portal theme. The theme has it all to let you create a full fledged job board website. The theme has a simple and professional design. With this theme, you get premium plugins included. For example, Job alerts, indeed, application deadline, apply with facebook, resume builder, resume manager and much more. With all these plugins, you can create a feature rich job boards in minutes. The advantage of this theme is that it doesn't require you to buy these plugins separately. JobsDojo is one of the jobs listing WordPress themes. It allows front-end submission of jobs as well as a resume. The theme can be used if you want to create a comprehensive job-based website. The theme works on two behalves. As a jobs directory for the job seekers and as candidate's directory for an employee. For the eCommerce features, you can use the WooCommerce plugin and integrate payment methods. Being a directory based theme, you have the features of advanced filters and maps. 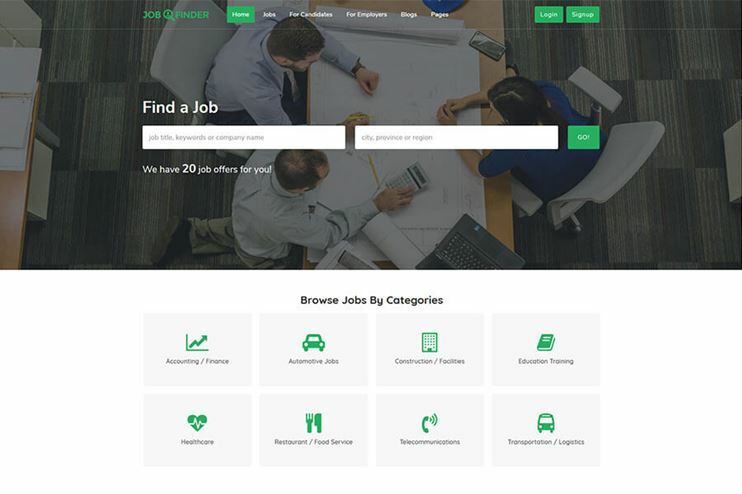 WPJobus is one of the premium job board WordPress themes in 2019. It is a beautiful theme with flexible and easy to use features. The highlight of this theme is its scalability and detailedness. The theme is right for you if you want much more than a basic job boards website. The theme supports resume, jobs and company profile as well. The job detail page is really detailed. It comes with lots of fields. And so is the resume page. The theme, therefore, can be used as a job board theme or a personal resume or company website. The JobsDirectory theme is a great way for employers and employment agencies to advertise jobs online. This is where you come in as a jobs portal owner. You are basically the link between employers and recruiters and job seekers. Imagine you launch your website and start charging for job post submissions. Wouldn’t this be a great way to earn money? This theme has been designed with so many monetization options to maximize your earning potential. One of these is the theme’s subscription type packages. Those are packages which charge a certain fee and allow a set number of job posts to be submitted. This theme also lets you create free job posting packages as well as premium ones. 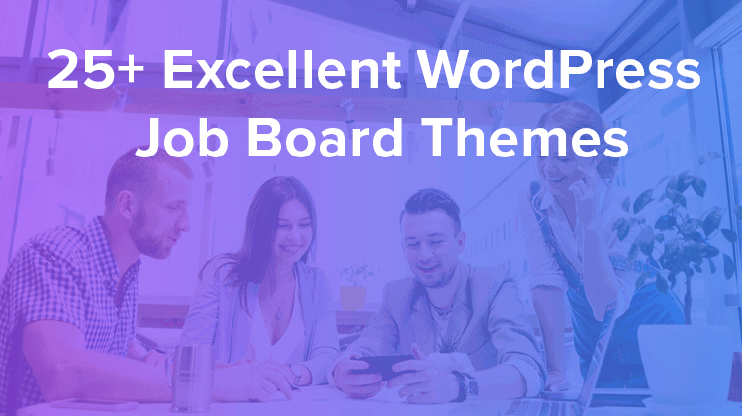 Jobera is one of the most customizable job board themes for WordPress websites in 2019. This theme has so many customization options to offer. The theme is compatible with the WP Job manager and resume manager. It allows front-end job and resumes submission. Jobera is compatible with a wide range of Job board plugins. It has all the features required for a perfect job board. Besides, it is flexible and very easy to use. JobBoard is a theme with a clean and modern design suitable for 2019. It is ideal for creating job board WordPress website that takes care of employment management. JobBoard is lightweight but feature packed. It has advanced job search features for letting users search the jobs with ease. The theme comes with bookmark or apply for job button. It also allows front-end submissions. The theme is SEO ready and comes with unlimited customization options. JobBoard is a theme with a clean and modern design suitable for 2019. It is ideal for creating a jobs board WordPress website that takes care of employment management. HireBee is for freelancers. It is a theme where employers post the projects and freelancers bid for that. Hirebee is simple and easy to use. The theme allows you, create pricing plans and display them on your website. It also has features for credit plans. The theme comes with the smart escrow system for payment acceptance. The theme has numerous other features to manage a freelancing website. It is SEO friendly. We too have some awesome freelancing themes for WordPress at Templatic. 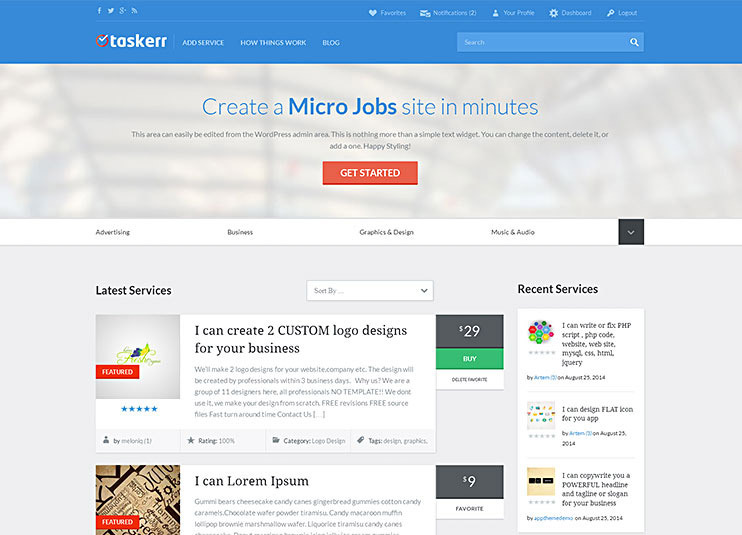 The Taskerr, is a micro jobs site. It is a simple theme based on a simple concept. This theme is flexible and comes with easy and intuitive customization options. The Taskerr comes with powerful monetization options. Create pricing plans for your website. 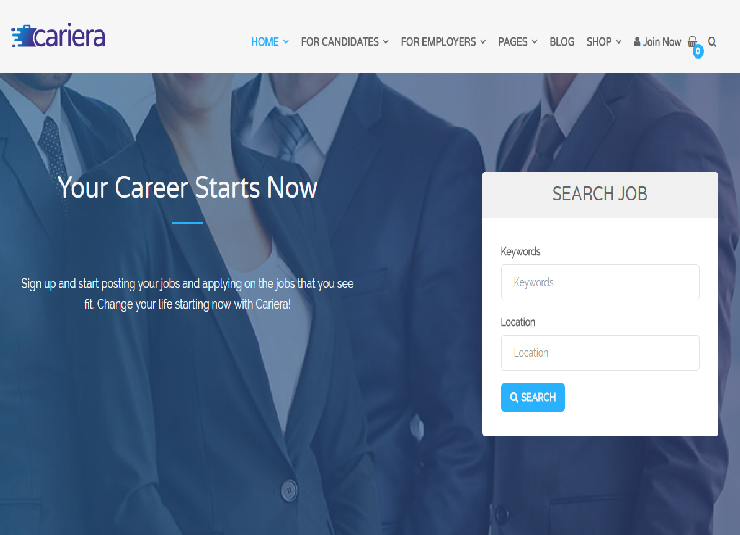 The theme connects the job seekers with the ones who want to get the job done. The persons looking for the job can post their skills and those who require the work done can hire them. It is child theme ready and SEO optimized. This is a theme for freelancing. It can be used to create a website with the freelancing projects in 2019. This theme is performance optimized and can even be used as a simple jobs website. Project theme is where the project owners post their projects, and the freelancers make their bids. The system comes with a credit facility and escrow system included. Click on the download button to know more about this. You can make clear pricing terms for your website. Charge in the percentage of money or a static price. Accept payment with the integrated Paypal system. The theme also lets you exchange digital files online. 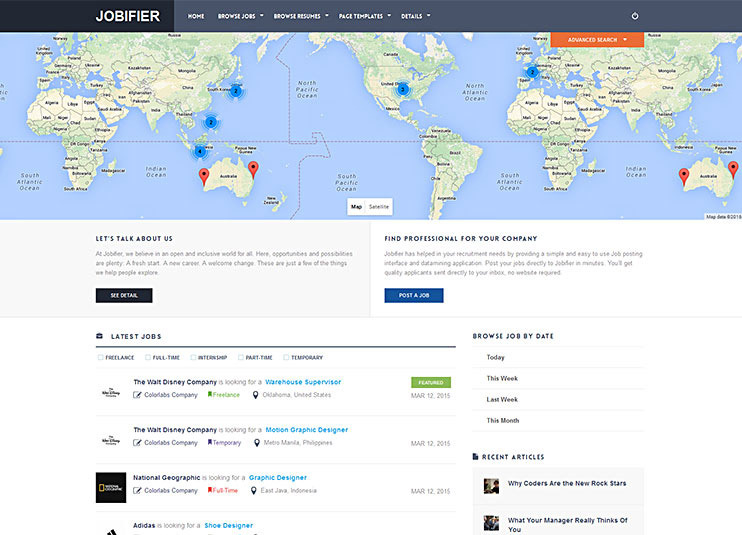 Jobifier is a job board WordPress theme. The theme can be used by big companies with many job openings. Besides, it is ideal for a professional job board theme. The theme can be used for free or paid job submissions. It also allows resume management features. This theme comes with a customizable job submission form, registration feature, and dashboards. The theme is SEO optimized and social media ready. It is a perfect theme to create a comprehensive job boards website. 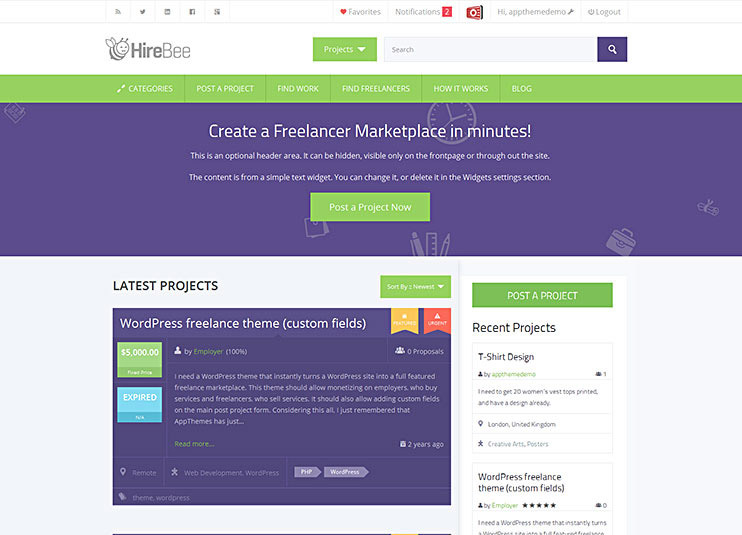 Freelance engine theme comes from Engine themes. It helps you create a website for Freelancing marketplace. This theme comes with powerful monetization options. For the bidding system, the theme takes the support of the Escrow system. Moreover, Freelance engine provides you with abundant customization options. For monetization, you can integrate multiple payment gateways. The theme is SEO optimized and supports Visual composer for drag and drop page building. 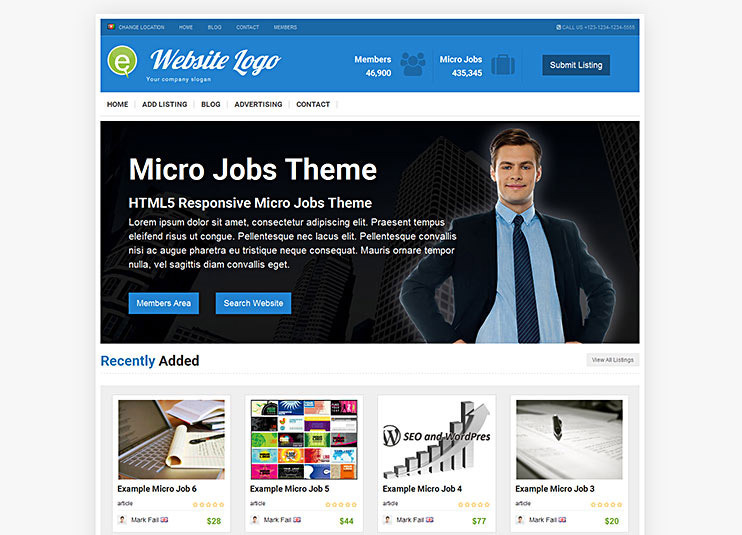 Mico Jobs as the name suggests is designed to let you create a micro jobs website. The theme comes with more than 10 demo designs to choose from. This theme comes with the major features built in. No need of extra plugins for that. MicroJobs provides compatibility with most of the popular and useful WordPress plugins. It is a highly customizable theme. It comes with advanced theme options. They are intuitive and lets you change the theme design easily. 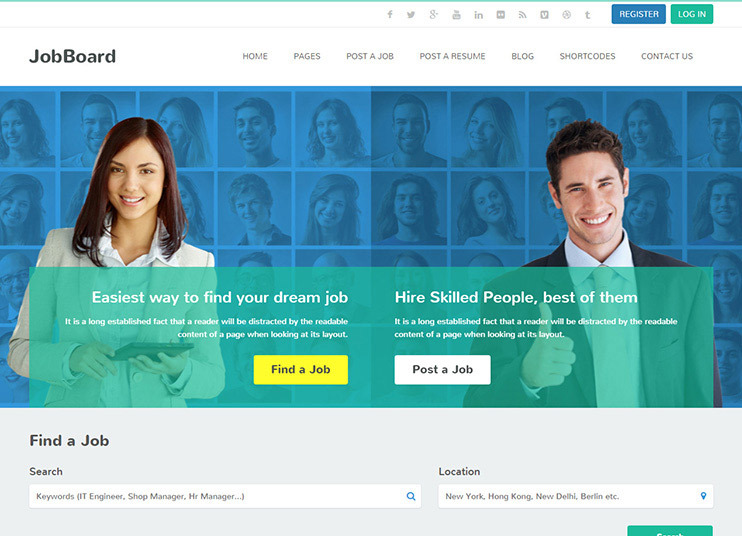 Jobpress is one of the most convenient and best job board themes for WordPress. It is a fully featured Job board theme. With this theme, you can launch your jobs website in minutes. It has everything. Front end jobs submission, custom post types, custom widgets, and much more. The theme can be used by nontechnical users, it does not require any technical skill to manage the theme. 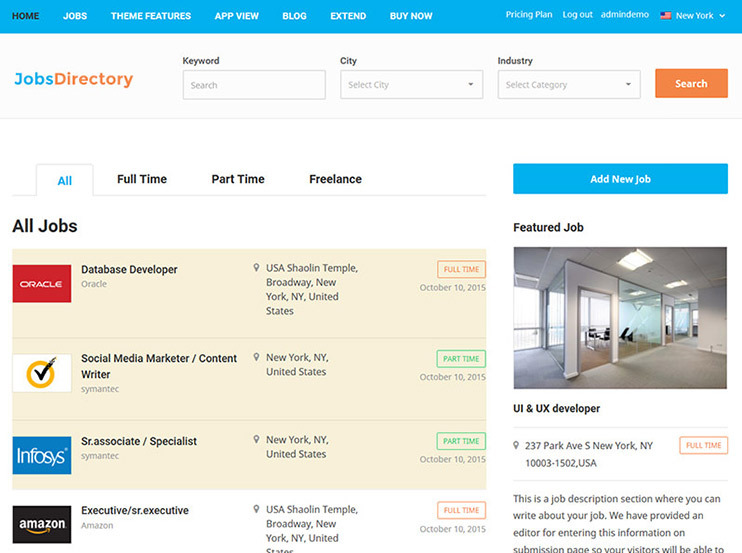 You can add and display unlimited job listings using this themes. 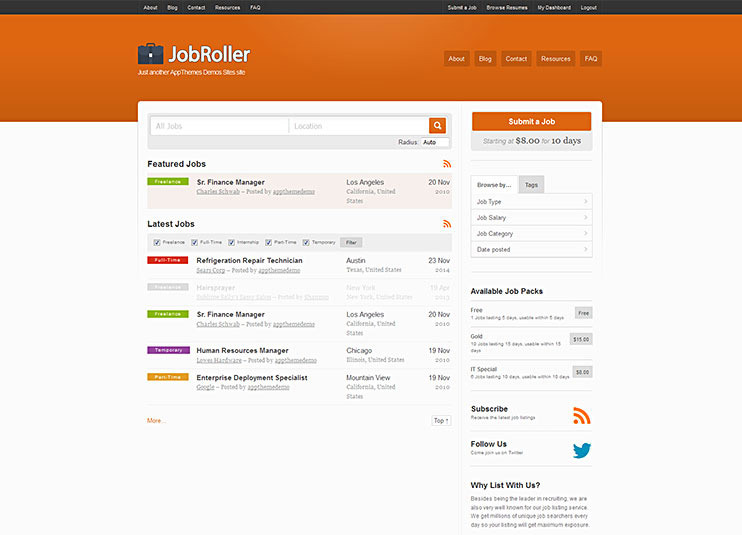 JobRoller WordPress theme is a feature-packed WordPress job board theme. It comes with all the features required by a Job board website. This theme has it all, it lets you create and display jobs, allow job and resume submission, and features that can help both, the recruiter and the job seekers. It has the best transaction management options. Job Roller has many customization options and advanced theme options. It is suitable for a medium to large sized job board website. The theme is SEO optimized. 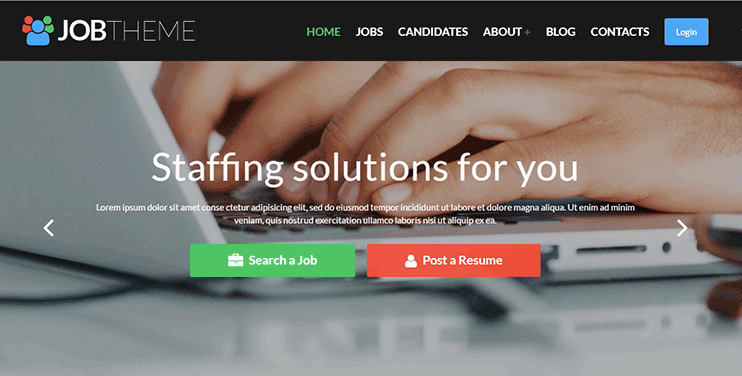 JobEngine from Engine themes is a comprehensive, flexible and easy to use WordPress theme that can be used for a jobs board website. With the advanced admin panel, you can change the theme settings easily. The theme allows to post a job and resume and allows online appointment. It comes in 10 languages already and allows further translations. The theme is SEO optimized. You can create payment plans and payment plans. The theme is perfect for creating a job listing website. 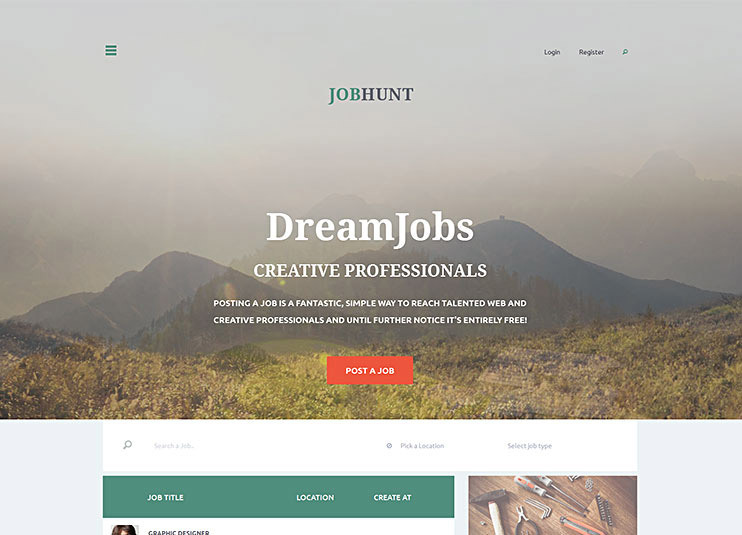 JobHunt is an elegant and feature-rich WordPress theme. It is well designed with beautiful and smooth animations. The theme has all the features required to build up a job board website. It is easy to use. The fullscreen header banner adds to the beauty of the theme. 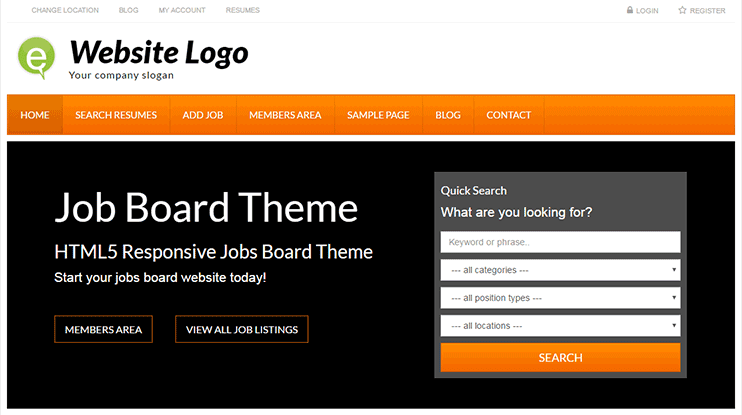 Go for this theme if you want to create a stunning WordPress job board website in minutes. 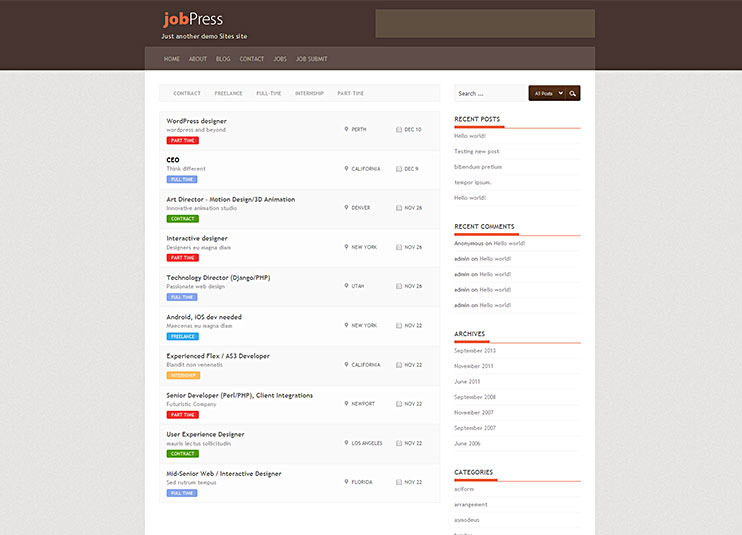 Job board theme from Premium press is a well-designed theme for a job portal. There are different versions of the theme design that are provided with the theme purchase, so you can the version you like. The theme can be used to create professional yet pleasant looking job portals that and has all the features like resume upload support, payment gateway support, location-based features, multilanguage support, etc. Using this theme requires no technical expertise. The theme makes creating job boards extremely easy by providing the sample data and intuitive options. This job board WordPress theme is flexible and really easy to use. It has some of the most desirable features like bookmarks,job alerts, search autocomplete etc. 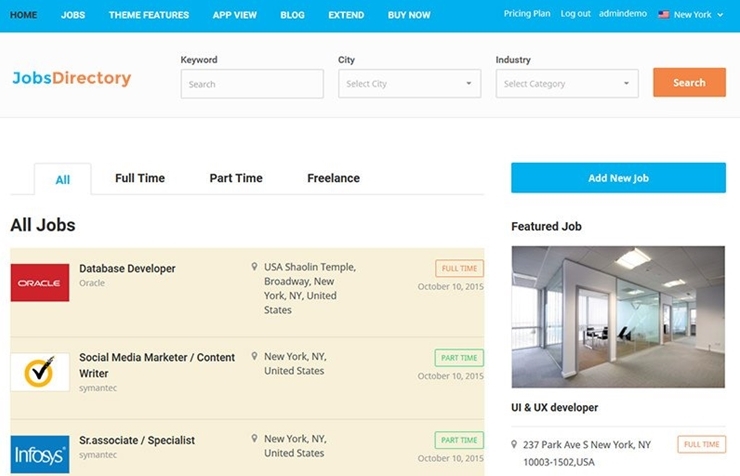 With the front end job submission feature, you can let your visitors easily submit the jobs. This job board theme has the advanced search feature that the visitors can use to easily search for jobs on your site. The theme allows compatibility for the most popular plugins like WPML, WooCommerce, Slider Revolution, Visual Composer, Mailchimp, etc. 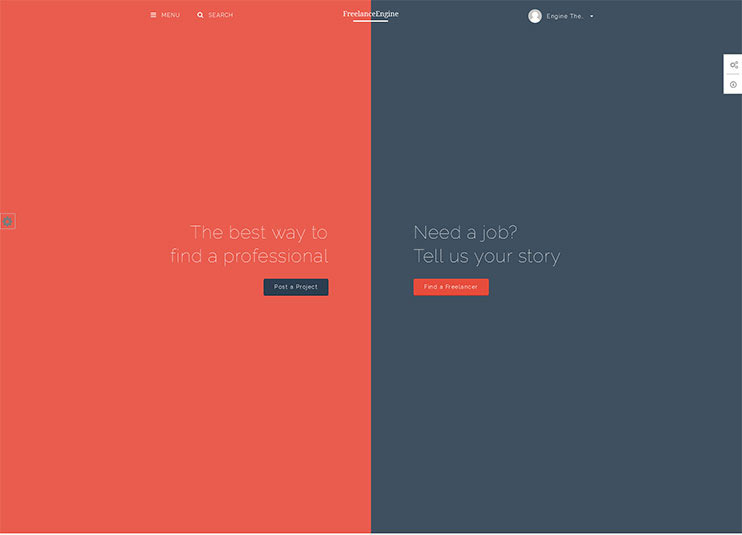 This is a beautiful parallax theme with video slider support to let you create extra elegant job board website. The theme is not just beautiful but has some of the best features that you might need to create your website. It is SEO friendly. The theme provides location-based services using the Google maps and also allows live chat. Job Portal theme for WordPress also makes it easy to manage how your website looks because it is totally widgetized. Careerfy is a job board theme with one click installation and pre-built ready to use demos. Therefore you can get started with your website in just minutes. 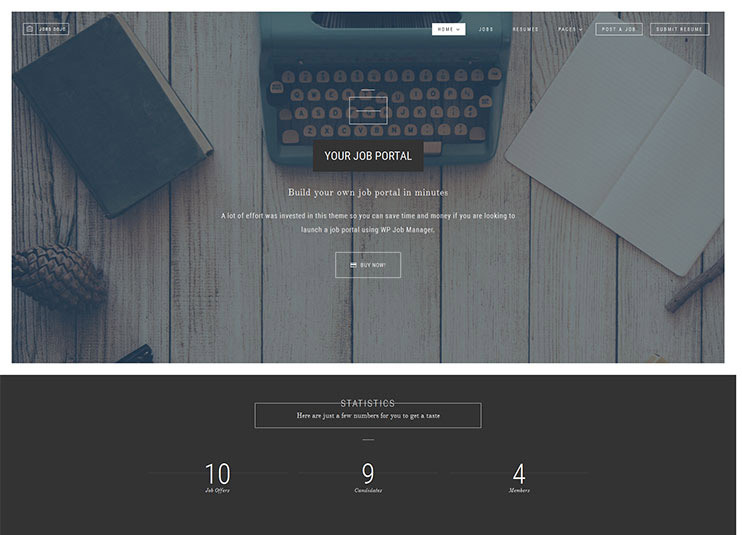 This theme is an ideal WordPress job portal theme choice for anyone who wants to create a simple complete fully Responsive job portal. The theme is compatible with Facebook, Visual Composer, and the multilingual plugin WPML. It comes with powerful sorting options for job listings and resumes and Multiple ways of showcasing job listings and resumes. This Job Portal theme helps you with easy to search and highly customizable functionality on your site. 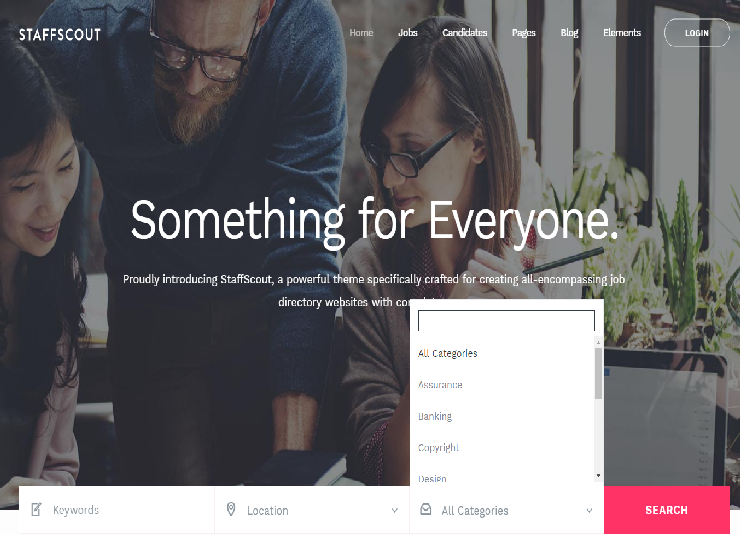 Craftory is a Directory Listing & Job Board Theme. It is optimized for fast performance, easy search and simple but eye-catching navigation. This Job Board theme has a lot of features like monetizing jobs, different payment gateway, Modern design and Google Adsense support for your job board website. The Job Board theme comes with the modern design which includes homepage banner design with sliders and videos and multiple homepage templates. The job board theme has the special functionality of displaying the site in RTL mode and in more than 600+ Google fonts that you can choose with various page variations. These WordPress job board themes are more like readymade websites. You won't have to worry about the coding. All these themes are designed to let you configure your website without ever touching the code. With these theme you can create a job board with multiple features. They are designed to for two way facilitation. The employers can display their vacancies and job seekers can post their resumes. Some themes will also let you earn passive income. All you need to do is choose the perfect fit, download it, replace the dummy data with original and your job board website is ready to be functional now. Also read: A complete guide on how to create a job board website with WordPress in 30 minutes? Thank for the post review. 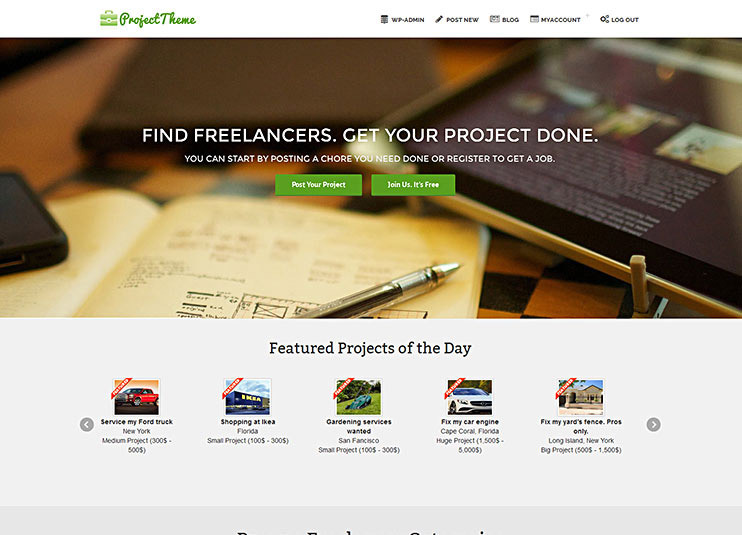 I think our WPFreelance theme also is a good option to build a freelancer site.